Found in FNA Volume 21. Treatment on page 239. Perennials or subshrubs, 30–50+ cm. Leaves mostly not lobed, blades oblanceolate to ovate, 8–25 × 4–8 mm (bases sometimes toothed or obscurely lobed, oil-glands 1–2 pairs near base, 1 near tip, each leaf). Peduncles 60–150 mm. Calyculi of 12–22 linear-attenuate, gland-bearing, bractlets 5–8 mm. Involucres campanulate to obconic, 15–18 mm. Phyllaries ca. 20, lanceolate to linear, separating in fruit. Ray florets (0–)7–13; corollas yellow-orange, becoming red-orange; tubes 5 mm, laminae 8–10 × 2.5–4 mm. Disc florets 50–80+; corollas yellow, 8–10 mm. 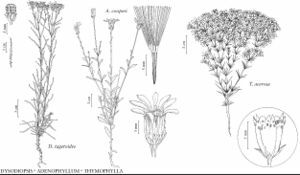 Cypselae 5–7 mm; pappi of 15–20 scales 7–10 mm, each comprising 5–9, basally connate bristles. 2n = 26.